I'm always losing my work keys. Once, I lost them for about three months and ended up finding them in a jacket I hadn't worn for a while. If I had some way of easily locating my keys, then I wouldn't have had to have bugged my co-workers to let me into my office a few times a week while I continued to look for them. Enter Tile. Tile is a little square keychain thingy that you can easily attach to various things that you don't want to lose. For example, your keys. You put the Tile on your keys, download the app and connect the Tile to you phone via bluetooth. 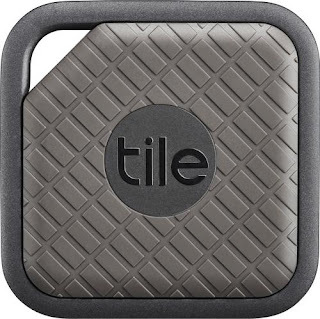 The Tile then keeps its location updated by getting your phone's location via its bluetooth connection to it. So long as your Tile is within 100 feet of your phone, you can use the Tile app on your phone to make your Tile play a ringtone so that you can easily find it. Let's say that your phone and your Tile are separated. Perhaps you left your keys on your desk at work and you went all the way home without realizing that you left them somewhere. Well, you can call up the Tile app to give you the last known location of that Tile. Even better, you can share tiles with other people which means that, if you need help from the Tile community to find a missing item, you can share your tile out and other people can help you find it. Imagine losing your keys somewhere at work and enlisting various Tile using co-workers to scouring the office campus sending out Bluetooth ringtone pings to find it. But, what if you lose your phone but not your Tile? Well, your phone is considered a Tile itself, so, you can use any of your connected Tiles to find your phone. Just double-click on the action button on of your connected tiles and your phone will ring, even if it's on silent. I know that this will be a very useful feature for me, because I lose my phone at least once a month. So far, I've got a Tile on my work keys and one on my personal keys. I'm thinking that I'd like to add one to my wallet and one to my messenger bag, and perhaps one to my suitcase. I do have to wonder what having three bluetooth signals at pocket level for over 8 hours a day will do to my sperm count. If you're interested in checking out Tile for yourself, and if you're keen on having me consider you to be "cool", then why not sign up via my referral link?